Dyson Ltd is a British technology company that designs and manufactures vacuum cleaners, hand dryers, bladeless fans, heaters and hair dryers. It sells machines in over 70 countries and employs more than 7,000 people worldwide. James Dyson encountered problems with the conventional wheelbarrow he was using while renovating his property. He found that the wheel sank into the mud, was unstable and was prone to punctures; the steel body caused damage to paint work and became covered with dried cement. By 1974 Dyson had a fibreglass prototype of a barrow with a ball instead of a wheel, the Ballbarrow. Later that year Dyson bought a Hoover Junior vacuum cleaner. The Hoover became clogged quickly and lost suction over time. Frustrated, Dyson emptied the bag to try to restore the suction but this had no effect. On opening the bag to investigate, he noticed a layer of dust inside, clogging the fine material mesh and preventing the machine working properly. The machine worked well only with a fresh bag, it lost suction over time. He resolved to develop a better vacuum cleaner that worked more efficiently. During a visit to a local sawmill, Dyson noticed how the sawdust was removed from the air by large industrial cyclones. Centrifugal separators are a typical method of collecting dirt, dust and debris in industrial settings. Such methods usually were not applied on a smaller scale because of the higher cost. Dyson hypothesised the same principle might work, on a smaller scale, in a vacuum cleaner. He removed the bag from the Hoover Junior and fitted it with a cardboard cyclone. On cleaning the room with it, he found it picked up more than his bag machine. This was the first vacuum cleaner without a bag. In his usual style of seeking solutions from unexpected sources, Dyson thought of how a nearby sawmill used a cyclone—a 30-foot (9.1 m)-high cone that spun dust out of the air by centrifugal force—to expel waste. He reasoned that a vacuum cleaner that could separate dust by cyclonic action and spin it out of the airstream would eliminate the need for both bag and filter. Dyson developed 5,127 prototype designs between 1979 and 1984, the first prototype vacuum cleaner, a red and blue machine brought Dyson little success, as he struggled to find a licensee for his machine in the UK and America. Manufacturing companies like Hoover did not want to license the design, probably because the vacuum bag market was worth $500m so the Dyson was a threat to their profits. The only company that expressed interest in the new cyclonic vacuum technology was Dyson's former employer, Rotork. Built by Italian appliance maker Zanussi and sold by Kleeneze through mail order catalogue, the Kleeneze Rotork Cyclon was the first publicly-sold vacuum cleaner of Dyson's design. Only about 500 units were sold in 1983. In 1985 a Japanese company, Apex Ltd., expressed interest in licensing Dyson's design and in March 1986 a reworked version of the Cyclon—called G-Force—was put into production and sold in Japan for the equivalent of US$2,000. The G-Force had an attachment that could turn it into a table to save space in small Japanese apartments. In 1991, it won the International Design Fair prize in Japan, and became a status symbol there. Using the income from the Japanese licence, James Dyson set up Dyson Appliances Ltd. in 1991. 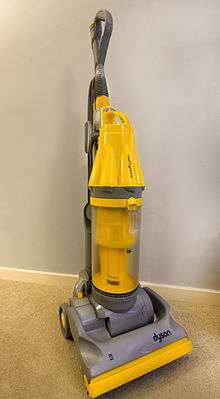 The first dual-cyclone vacuum built under the Dyson name, the DA 001, was produced by American company Phillips Plastics in a facility in Wrexham, Wales beginning in January, 1993 and sold for about £200. Due to quality control concerns and Phillips's desire to renegotiate the terms of their contract to build the vacuum cleaner Dyson severed the agreement in May 1993. Within two months Dyson set up a new supply chain and opened a new production facility in Chippenham, Wiltshire, England; the first vacuum built at the new facility was completed 1 July 1993. The DA 001 was soon replaced by an almost identical vacuum called DC01. Even though market research showed that people wouldn’t be happy with a transparent container for the dust, Dyson and his team decided to make a transparent container anyway and this turned out to be a popular and enduring feature which has been heavily copied. The DC01 became the biggest selling vacuum cleaner in the UK in just 18 months. By 2001, the DC01 made up 47% of the upright vacuum cleaner market. The company introduced a cylinder machine, the DC02, and produced a number of special editions and revised models (DC02 Absolute, DC02 De Stijl, DC05, DC04, DC06, DC04 Zorbster). On 2 January 2001 the company name was shortened from Dyson Appliances Ltd. to simply Dyson Ltd. In April of that year the DC07, a new upright vacuum cleaner using "Root Cyclone" technology with seven cyclone funnels instead of the original dual-cyclone design, was launched. By 2009 Dyson began creating other technologies: the AirBlade hand dryer, the Air Multiplier 'bladeless' fan and Dyson Hot, the 'bladeless' fan heater. In 1985, Amway was sued by Dyson for the copyright infringement of Dyson dual cyclone prototype machine. In April 1984, Dyson claims that he had sent the prototype machines, drawings and confidential information to Amway as part of the contract. In January 1985, Amway produced the CMS-1000, a machine which was very similar to the Dyson design. Less than a month later, Dyson sued Amway. In 1999, the US company Hoover was found guilty of patent infringement. In July 2010 Dyson lost a legal action against Vax in the High Court. The ruling rejected Dyson’s claim that the Vax Mach Zen had infringed one of its registered designs. However, although it lost this case in Britain (and the subsequent appeal in 2011) it won a similar case against Vax's sister company, Dirt Devil, in France. In September 2013 Dyson initiated court proceedings against Samsung, alleging they had infringed on a steering mechanism patent that Dyson holds, which has later been dropped. The James Dyson Award is an international student design award running in 18 countries. It is run by the James Dyson Foundation, James Dyson’s charitable trust, as part of its mission to encourage the next generation of design engineers to be creative, challenge and invent. The international winner of the James Dyson award will receive for themselves and for their university. The James Dyson Foundation aims to inspire young people to study engineering and become engineers. By visiting schools and universities and providing workshops for young people, the foundation hopes to encourage creativity and ingenuity. Over 727 schools in Great Britain and Northern Ireland have used Dyson’s education boxes to send to teachers and pupils in order to learn more about the design process. The James Dyson Foundation also provides bursaries and scholarships to aspiring engineers. A Dyson vacuum cleaner uses cyclonic separation to remove dust and other particles from the air stream. Dirty air enters a conical container called a cyclone, where it is made to flow in a tight spiral. Centrifugal force throws the particles out of the airflow onto the wall of the container, from which they can fall into a bin. The vacuum cleaner uses several stages of cyclones. Dyson states that centrifugal forces can reach up to 150,000 g.
The Dyson Air Multiplier is a household appliance, functioning as a cooling fan. It was introduced in October 2009. Like other bladeless fans, the apparatus itself has no visible external blades, as the fan blades are concealed within the body of the product. The principle of bladeless-fan technology is that air is pushed through an annular aperture, being a forward-facing circular slit in a vertical ring-shaped frame, the "amplifier". This creates a thin jet stream of air that, while emerging from the aperture, passes over an airfoil-shaped ramp that channels its direction. Surrounding air is pulled along with the airflow, producing a phenomenon called entrainment. At the same time, the airflow away from the ring forward creates an area of low pressure. The low pressure pulls in more air from behind the machine (filling the gap), which then passes through the open area of the ring-shaped frame and is drawn into the air stream. This phenomenon is called inducement. Dyson states that the initially generated air flow is multiplied between 15 and 18 times for the models AM01, AM02 and AM03, projecting a smooth stream of uninterrupted air. In March 2014, the second-generation models of the Air Multiplier were acoustically re-engineered so that the bladeless fans were quieter than their predecessors by improved airflow and a Helmholtz resonator to cancel a 10 kHz whine. In 2014, Dyson invested  in a joint robotics lab with Imperial College London to investigate vision systems and engineer a generation of household robots. In 2001 they got close to launching a robot vacuum, the DC06, but James Dyson pulled it from the production line as it was too heavy and slow. Dyson invested in a Dyson Chair at Cambridge University in November 2011. The Dyson Professor of Fluid Mechanics focuses on teaching and researching the science and engineering behind air movement. In addition, Dyson invested hundreds of thousands pounds in a Dyson research branch at Newcastle University in May 2012 to investigate the next generation of Dyson digital motor and motor drive. Initially, Dyson vacuum cleaners and washing machines were made in Malmesbury, Wiltshire. In 2002, the company transferred vacuum cleaner production to Malaysia. Dyson stated that the company requested planning permission to expand the factory to increase vacuum cleaner production, but that this application failed. However, the local government says that no such permission was ever sought, as the land Dyson planned to use was privately owned and the original owner did not want to sell. The move was also due to the most suppliers being located in the Far East and Dyson wanted to get as close as possible to be cost effective. Also, at the time of the interview, James Dyson mentioned that the market was largest in New Zealand, Australia, Japan and potentially in the Far East market, and therefore the decision to shift production to Far East was driven by the need to get closer to the consumer base. As Dyson was the major manufacturing company in Wiltshire, outside Swindon, this move created some controversy as trade unionists claimed that the move would impact the local economy hard. In the following year, washing machine production was also moved to Malaysia. The move was driven by production costs in Malaysia which are lower by 30% compared with the UK, however it created a loss of 65 jobs. In 2004, the Meiban-Dyson Laundry Manufacturing Plant was launched in Johor, Malaysia. The newly opened RM 10 million (approx. $2.63 million) plant is a joint venture between Dyson and the Singapore-based Meiban Group Ltd., which has manufacturing facilities in Singapore, Malaysia and China. Dyson stated that the cost savings from transferring production to Malaysia enabled investment in research & development at their Malmesbury head office. In 2007 Dyson formed a partnership with the Malaysian electronics manufacturer VS Industry Bhd (VSI) to take on a major role in Dyson's supply chain, from raw material sourcing and production to distribution. VSI also undertook an extensive production plan to supply finished product to Dyson's destination markets around the globe (America, UK, Japan, etc.). While it is often mentioned that Dyson has nearly 4,000 employees, Dyson has not publicly stated where those employees are actually located, however, it is known that VS Industry Bhd (VSI) currently has around 4,250 employees at their Malaysian facility which manufactures Dyson products, and in 2007 it was reported that Dyson alone was responsible for 80% of VS Industry Bhd (VSI) revenue. In March 2011 Sir James Dyson, the founder and current managing director of Dyson gave an interview to The Sunday Times newspaper in the UK; he said that foreign students take the science and technology knowledge home with them after completing their studies. Dyson said some overseas students continue to pose a threat even after leaving the UK. "Britain is very proud about the number of foreign students we educate at our universities, but actually all we are doing is educating our competitors." "I've seen frightening examples. Bugs are even left in computers so that the information continues to be transmitted after the researchers have returned home." David Willetts, the government minister responsible for British universities, said he will thoroughly investigate the statement provided by James Dyson. In December 2011, The Independent reported that Bell Pottinger executive Tim Collins had been filmed by the Bureau of Investigative Journalism saying that PM David Cameron had raised a copyright issue with Chinese premier Wen Jiabao on behalf of Dyson Limited "because we asked him to". 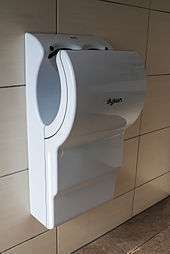 On 5 December 2012, a lawsuit by hand dryer manufacturer Excel Dryer was filed against Dyson, claiming that Dyson's advertising comparing the Airblade to the Excel Dryer XLERATOR is deceptive. Dyson's advertisements state the XLERATOR produces twice as much carbon dioxide, is worse for the environment, and costs more to operate than the Airblade. Excel Dryer claims that Dyson was falsifying its comparisons by submitting a 20-second dry time for the XLERATOR to the Materials Systems Laboratory at the Massachusetts Institute of Technology, rather than Excel Dryer's tested 12 second dry time, thus inflating energy consumption figures in the Airblade's favour. The case is still pending. 1 2 "DYSON LIMITED: Company number 02627406". Companies House. Her Majesty the Queen. Retrieved 1 May 2016. 1 2 "Dyson to invest £1bn in battery technology thanks to profit surge". The Guardian. Retrieved 28 March 2016. ↑ Dyson, James (2008). Against The Odds. South Western. ↑ "A new idea". Inside Dyson. Retrieved 29 July 2013. 1 2 3 4 Earl, Peter; Wakeley, Tim (2005). Business Economics: A Contemporary Approach. McGraw-Hill Education. pp. 142–146. ISBN 0077103920. ↑ "James Dyson: Business whirlwind". BBC News. 5 February 2002. Retrieved 28 June 2007. ↑ "A Clear Bin Policy". RGC Jenkins & Co., Trade Mark and Patent Attorneys. ↑ Crewe, Louise; Gregson, Nicky; Metcalfe, Alan (2009). "The Screen and the Drum: On Form, Function, Fit and Failure in Contemporary Home Consumption". Design and Culture. 1 (3). ↑ "Dyson Vacuum Cleaners, Fans, Heaters & Tools - Official Site". dyson.com. ↑ "British Inventor Claims Theft of Vacuum Idea v". The Argus Press. 9 May 1988. ↑ Robert Uhlig, Technology Correspondent (4 October 2000). "Dyson cleans up in patent battle with rival Hoover". Telegraph.co.uk. ↑ "Dyson loses design case". ↑ "Dyson loses Vax court battle about vac design - October - 2011 - Which? News". which.co.uk. ↑ "Samsung over new vacuum's steering mechanism". BBC News. 10 September 2013. Retrieved 10 September 2013. ↑ "About the Award". James Dyson Award. James Dyson Foundation. Retrieved 23 October 2013. ↑ "Home - James Dyson Foundation". James Dyson Foundation. ↑ "Dyson Animal vacuum cleaners for pet owners". Dyson Ltd. Retrieved 14 November 2015. 1 2 Duncan Geere. "How Dyson's Air Multiplier works". Pocket-lint. ↑ Stinson, Liz. "How Dyson made its bladeless fan 75 per cent quieter". ↑ "Sir James Dyson plans to make affordable household robots". Telegraph.co.uk. 9 February 2014. ↑ Colin Smith. "Dyson and Imperial to develop next generation robots at new centre". imperial.ac.uk. ↑ "Dyson invests £5m in robotic vision lab with Imperial". BBC News. ↑ "Ingenious Britain: Dyson invests £1.4m in academic research at Cambridge". cam.ac.uk. ↑ "BBC NEWS - UK - England - Wiltshire - Fresh blow for Dyson plant". bbc.co.uk. ↑ "Design News - Serving the 21st Century Design Engineer". appliancemagazine.com. 1 2 "Overseas Students in UK Stealing Technology Secrets: James Dyson Told UK's Sunday Times newspaper". Allvoices.com. 28 March 2011. Retrieved 28 July 2011. ↑ "Are British inventions at risk from Chinese students?". Ibtimes.com. 28 March 2011. Retrieved 28 July 2011. 1 2 3 Kenneth Tan (28 March 2011). "UK inventor Sir James Dyson: Chinese students are stealing our secrets". Shanghaiist. Retrieved 28 July 2011. 1 2 Robert Watts and Jack Grimston (27 March 2011). "Chinese students steal secrets: inventor James Dyson". The Australian. Retrieved 28 July 2011. ↑ Newman, Melanie; Wright, Oliver (6 December 2011). "Caught on camera: top lobbyists boasting how they influence the PM - UK Politics - UK - The Independent". The Independent. London. ↑ "Conservatives under pressure to explain links to lobbying firms". The Daily Telegraph. London. 6 December 2011. ↑ "xcelerator v dyson". Docstoc.com. Wikimedia Commons has media related to Dyson.